There are many possible ways in which climate change could impact human health. 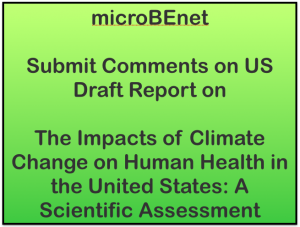 The U. S. Global Change Research Program has issued a new draft report on this topic and is soliciting public comments about this report (see USGCRP Climate for more information). 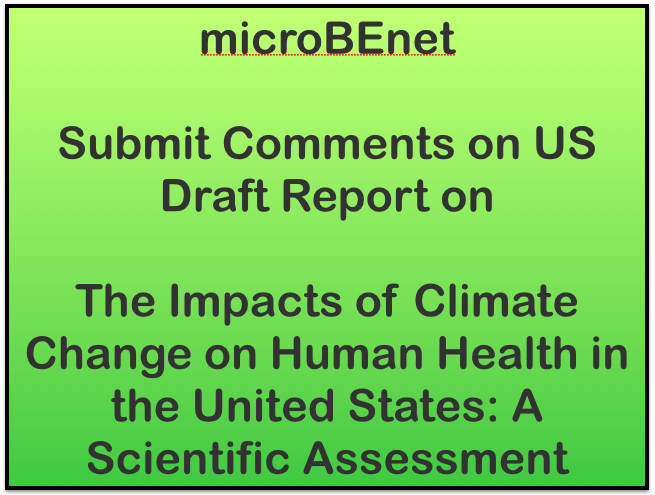 The report is The Impacts of Climate Change on Human Health in the United States: A Scientific Assessment. Public comments will be taken until June 8. I have looked through the report and there are many areas in there with connections of microbiology. Especially the sections on Air Quality Impacts and Water-Related Illness and Food Safety, Nutrition, and Distribution. If you have ideas about climate change and health, such as in these areas, it would be worth looking at the report and submitting comments. Fisk, W. J., 2015: Review of some effects of climate change on indoor environmental quality and health and associated no-regrets mitigation measures. Building and Environment, 86, 70-80, doi:10.1016/j.buildenv.2014.12.024. Stephens, B., and J. A. Siegel, 2012: Penetration of ambient submicron particles into single- family residences and associations with building characteristics. Indoor Air, 22, 501-513, doi:10.1111/j.1600-0668.2012.00779.x. One related area that is not covered that seems like it should be is how as we make more and more buildings “green” in terms of energy, we also greatly chage the microbial ecology in those buildings. The more we seal up buildings, it seems likely that the microbial ecology will start to look a lot like the residents of the building rather than the outdoors. This is suggested by work from Jessica Green and Jack Gilbert and others. This topic certainly seems like it should be in the report — so I will be making that suggestion. To make comments one has to go to this link and register. Thanks to Paula Olsiewski for pointing me to this report and call for comments.